The newest bullion coin program from Britain’s Royal Mint is the Queen’s Beast Series. A 10-coin collection, the design of each new coin will reflect one of the creatures present at the coronation ceremony of Queen Elizabeth II in 1953. The 2016 Silver British Queens Beast Coin is available today on Silver.com in near-perfect condition. First-ever 2 oz silver bullion coin from the Royal Mint. Bears a grade of Mint State 69 from the Professional Coin Grading Service. Reverse includes the Lion of England. As the first design release in the Queens Beast range from the Royal Mint, these 2016 Silver British Queens Beast Coins depict the Lion of England. It was one of the 10 animals featured in the ceremony crowning Queen Elizabeth II as the sovereign monarch of England in 1953. These coins also hold the distinction of being the first-ever 2 oz silver bullion coins produced at the Royal Mint. In addition to this silver coin, the Royal Mint struck the Lion of England design on a 1 oz gold coin and fractional-weight gold coin. 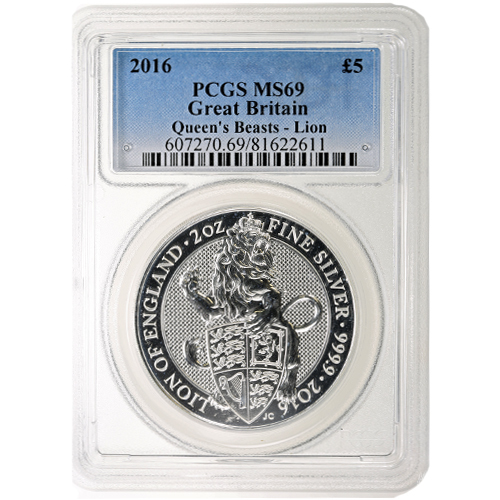 Each 2016 Silver British Queens Beast Coin in this listing is considered near perfect by the PCGS. Coins with an MS69 grade have full, original mint luster, but also feature a maximum of two minor flaws. These flaws include minuscule hairlines or contact marks. The reverse of the Queens Beast coin features the Lion of England. Lions became a popular symbol of heraldry in England during the medieval ages, with many knights choosing them as a representation of their bravery and fortitude. 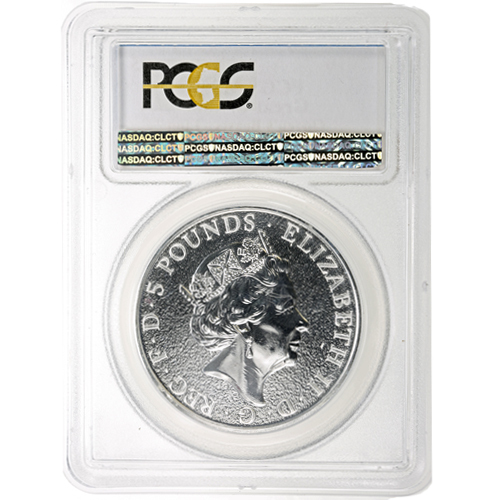 On the obverse of all 2016 Silver British Queens Beast coins you’ll find the newest right-profile portrait of Queen Elizabeth II. Her Majesty’s effigy is regularly updated by the Royal Mint and its artists, with this fifth-generation design coming from Jody Clark in 2015. Clark is the youngest artist, at 33 years old, to ever create Her Majesty’s portrait for British coinage. The Royal Mint was founded in London in the 9th century, making it one of the world’s oldest operating mint facilities. Today it is responsible for the production of British sovereign coinage and bullion products alike. Silver.com customer service is available to help answer any of your questions. You can reach us on the phone at 888-989-7223, connect with us online through our live chat, or send us an email with your inquiries.